It's time for the Everybody Art Challenge and this week we have a great sketch for you to follow. Today I have used my new Hannah Lynn stamp. Isn't she beautiful? Her name is Genevieve. I bought her alongside another image that I haven't used yet from Crafts and Me . Paper - Die Cuts With A View - Black Currant Stack, edged with distress ink and then frayed using scissors. Embellishments - Prima flowers coloured with Copics (same colours as hair), edged with white embossing powder and finished with a gem brad in the middle. Black Organza spotty ribbon. Sentiment - Printed from the computer and cut into strips. Jenny - this looks great! Beautifully detailed and coloured! What a FABULOUS, fabulous, card! Love EVERYTHING about it! WoW!!! Great work, your card is gorgeous!!! Fab creation. Thanks for joining in at LIIU. A fabulous creation! 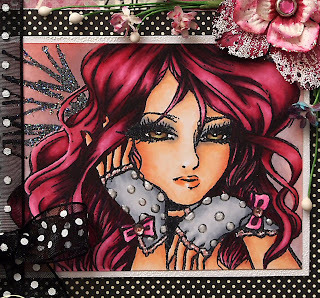 I love your palette, and the embellishments! 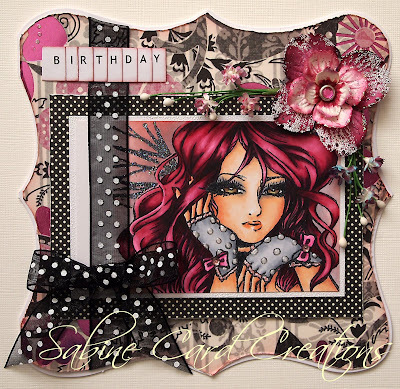 Thanks for sharing with us at Card Crafter's Circle! Jenny, your coloring is so very awesome. It reminds me of a cartoon my kids watched called, Jem...it's done so very well! Thanks for joining us at Card Crafter's Circle! the stamp, the colours, the lay out! !